can i ask some questions about this novel? because i am a little bit confused with some questions. why pi tells tow different stories to the Japanese transportminister? i think the tiger stands for the deadly situations in our life.but why author chose a hyena and an orang-utan as the other animals on the boat? 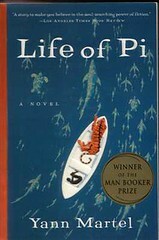 because the Japanese men didn’t believe the Pi’s story of survival with a tiger on the boat at all, and, time and again, pushed Pi to tell them what on earth happened, so Pi invented another version of the story. But in fact, for the readers, as well as for the japanese men, we cannot determine what was really happening, either, therefore, Pi’s question is also applied to us, which one do we think is better, or more inclined to believe? In some sense, it’s a trick played by the author, maybe would inspire a lot of further discussion. as for the other animals in the novel, they may have some different symbolic meanings, other than the tiger, I think.